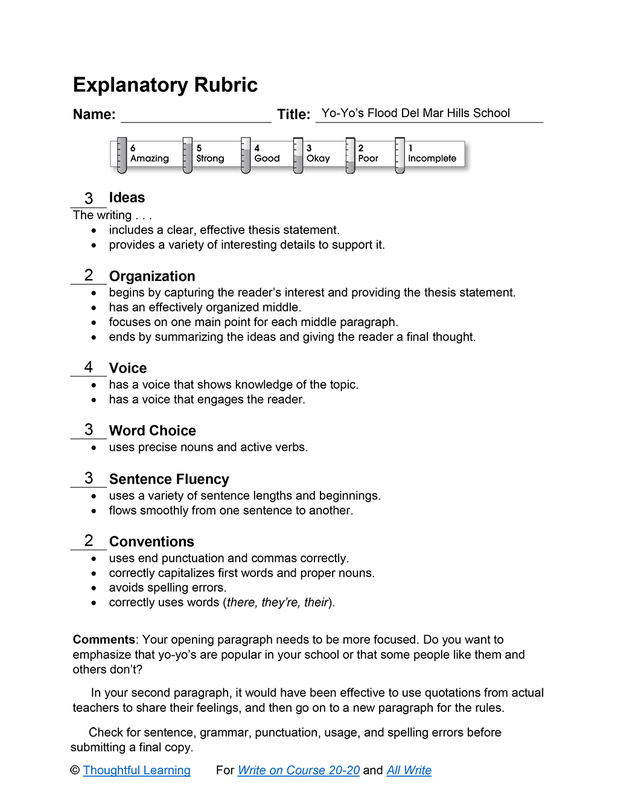 This model of explanatory writing focuses on a fad at a middle school. Why did the chicken cross the road? To get to Del Mar Hills School and see all the yo-yo’s. You don’t walk out of your classroom without seeing at least eight yo-yoers throwing those yo-yo’s. Everyone is getting yo-yo’s. Alot of people claim they started this fad. Most of the yo-yo population at Del Mar Hills is sixth and seventh graders. Some people think yo-yo’s are a total waste of time. They don’t see what’s so special about yo-yo’s. Do teachers dislike this yo-yo craze. No they don’t mind. As long as the kids don’t do it in the classroom. Their are pretty much two rules for yo-yo’s at school; no hitting people and no playing whit the yo-yo’s near other kids. Yo-yo’s vary in size, shape, quality, and physical feetures. Some yo-yo’s you might see are the Brain, Fireball, tornado, Tiger shark, Turbo Bumble Bee, Viper, and Silver Bullet. The Brain has a special physical feeture that allows it to come up automaticaly after it sleeps. The Viper is a very large yo-yo. The Bumble Bee and Silver Bullet are said to sleep for along time. If you owned a yo-yo, some common questions you could be asked might be “what kind of yo-yo is that?” or “can you do a rock-the baby”? If you have a yo-yo stashed away somewhere, go find it. Play with it for awhile. If you don’t like it, stash it away again. Who knows, you might like it someday. Yo-Yo’s Flood Del Mar Hills School by Thoughtful Learning is licensed under a Creative Commons Attribution-NonCommercial-ShareAlike 4.0 International License. Based on a work at k12.thoughtfullearning.com/assessmentmodels/yo-yo%E2%80%99s-flood-del-mar-hills-school.